Where are ponds and lakes in your community? What role do they play in your economy? How are lakes similar to ponds? How are they different? What kind of organism makes up the greatest amount of living material in a pond? 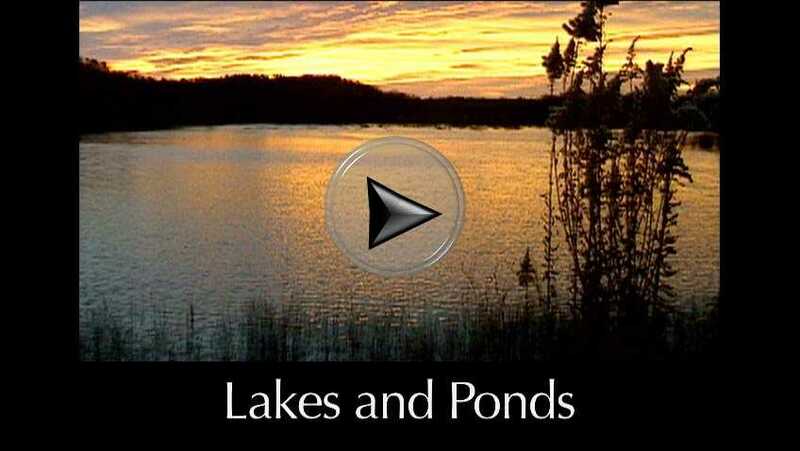 Besides providing food, what other roles do plants have in lake and pond ecosystems? How are plants that live under water similar to plants that live on land? How are they different? How do temperature and oxygen levels in ponds change during each 24-hour period? How do ponds change over time? What are the benefits and costs of building new reservoirs as a solution for Texas’ future water needs? Consider the economy and the environment in your discussion. Texas has over 1.2 million acres of freshwater lakes, ponds, and reservoirs in 2013. These bodies of lentic water (water that is not flowing) are among Texas’ most -known and popular aquatic ecosystems. 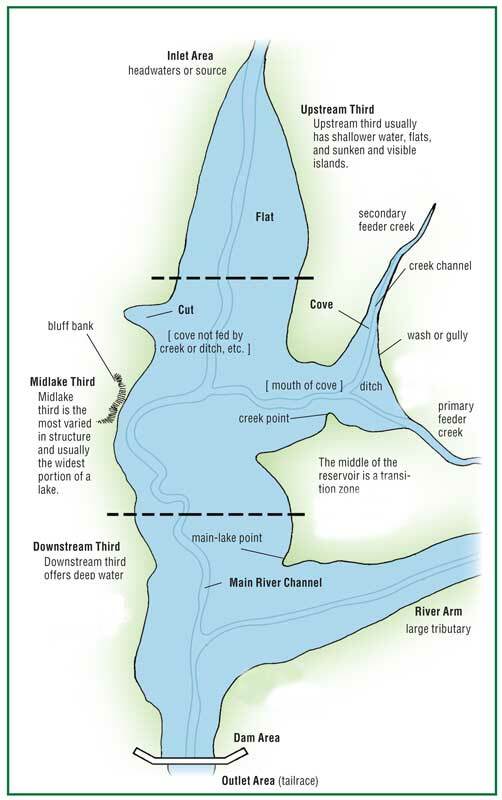 Almost all of Texas’ lakes and ponds were built by placing dams across streams or rivers (Fig. 9.1). Because of this they can also be called reservoirs. Usually only very large bodies of water are actually named “reservoir.” All the rest of the water bodies are usually called a lake or pond, depending on size. These range from small ranch and farm ponds of less than an acre to large lakes containing millions of acre-feet of water such as Lake Lewisville near Dallas, Lake Travis near Austin, and Lake Amistad on the Rio Grande. There are over 200 major reservoirs and over 5,000 smaller ones in Texas. The only naturally-formed lake in Texas is Caddo Lake, created by a large log jam hundreds of years ago on the Red River. Although a natural logjam created the lake, today dams and reservoirs keep its waters under human control. Ponds are usually shallow enough so if the water is clear sunlight can reach the bottom and plants can grow throughout the pond. Plant roots grow into the pond bottom and hold the soil, making the water even clearer and allowing more plants to grow at greater depths. 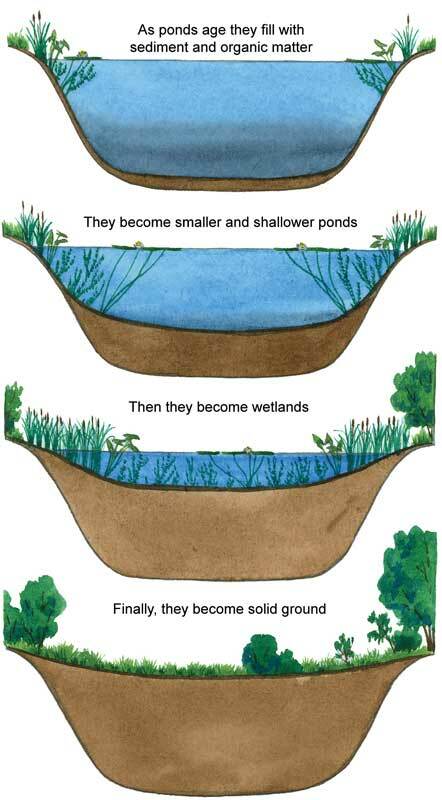 This is important to the life of a pond because the plants produce much more than food. Being shallow allows a pond’s water temperature to remain about the same everywhere in the pond. The pond’s water temperature changes quickly as air temperature goes up or down. Dissolved oxygen in a pond can also change fast. Underwater life depends on oxygen in the water. The main sources of dissolved oxygen are surface air and photosynthesis by plants and algae in the water. Oxygen is dissolved in water when water mixes with air at the water’s surface. Waves and wind help mix air into the water. Water temperature and salinity can affect the amount of dissolved oxygen in water. Cold water can “hold” more dissolved oxygen than warm water. Freshwater holds more dissolved oxygen than saltwater. Another source of oxygen is aquatic plants and phytoplankton. These organisms give off oxygen in the water as a byproduct of photosynthesis. A pond’s oxygen levels can vary widely over the course of a day. This happens because during the day air from the surface and oxygen from plants is constantly replenishing the dissolved oxygen consumed by animals and by aerobic decomposition of detritus and other decaying matter. Plants stop producing oxygen at night because photosynthesis requires sunlight. During the night oxygen continues to be used by animals and aerobic decomposition. This results in many ponds having higher dissolved oxygen levels in the day than at night. While lakes and ponds have much in common, lakes are larger and deeper. This greater size and depth makes for some differences in dissolved oxygen levels, plant growth, and temperature. In a lake, the amount of oxygen dissolved in the water stays pretty even over a 24-hour period. While a strong wind can ruffle up a pond’s surface, on a lake, it can whip up high waves. This mixes air into the water, helping increase dissolved oxygen levels. In at least some places, the water in a lake is too deep for plants to grow on the bottom. Only in shallow areas, such as around the shore or islands, will there be enough sunlight reaching the bottom to allow plants to grow. 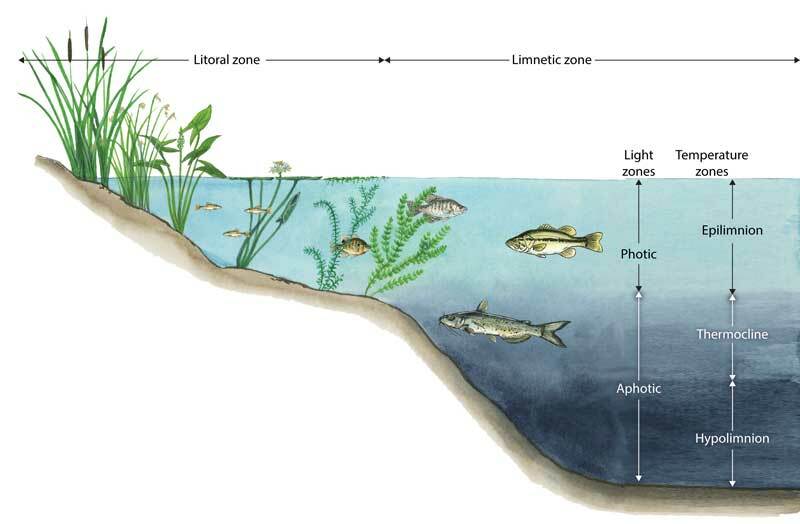 This is the littoral zone. (Fig. 9.3) Lakes often include a transition zone containing a narrow band of wetlands extending out from shore. The ecology of the shallow shoreline zone is like pond ecology. Toward the middle of the lake, away from shore, is the open-water zone called the limnetic zone. This part of the lake is too deep for sunlight to reach the bottom, so no plants grow on the bottom there. Despite not reaching bottom, sunlight still shines into the water in this zone to some depth. The part of the limnetic zone that gets sunlight is called the photic zone (also called the euphotic zone). Some species of large and open water fish spend much of their time in the photic zone. They may swim into the littoral zone now and then to feed or spawn, but these visits are only temporary. There is also a deep-water zone located just below the photic zone called the aphotic zone. There is too little sunlight or oxygen reaching this zone for plants or algae to grow. Dead organic matter sinks to the lake bottom, where bacteria and other decomposers such as some worms and larval stages of some insects break it down. This is called the benthic zone. The overall temperature in a lake is fairly even from day to day, while surface temperatures can vary. Lake water in Texas is warmest at the surface and gets colder the deeper you go in the lake until you reach the bottom where it is possible for water to become as cold as four degrees centigrade (the temperature where water is most dense, thus, heaviest). Underwater plants and plankton make up most of the food base for entire pond and lake ecosystems. Plankton are tiny, mostly microscopic, free-floating organisms. There are two kinds of plankton. Phytoplankton are photosynthesizing aquatic organisms. They can grow in a lake’s sunlit open-water photic zone, where rooted plants can’t. They are producers that release oxygen into the water and serve as food for many kinds of aquatic animals, including the second main type of plankton, which are called zooplankton. These are tiny, free-floating animals. Plankton have a high nutritional content and make up most of the living stuff in a pond. Zooplankton eat phytoplankton and many species eat each other. They can be barely visible, complex organisms, such as water fleas, or they can be as small as single-cell protozoa. Many invertebrates and small fish eat plankton. Some mollusks, such as clams and mussels, and fish can even filter plankton from the water by using specialized mouth parts and adaptations to gills. Organisms that feed this way are called filter feeders. Examples of filter feeding fish in Texas lakes are gizzard shad and paddlefish. They spend most of their time in the open water where they can feed on plankton. In the open water of a pond or lake it may seem that plankton have no defense to escape these filter feeders except by luck. Most zooplankton and some forms of phytoplankton have ways to move about. Despite being so tiny, many species can move very quickly. They also may hide among the plants growing underwater. But considering how fast and far even a small fish can move in comparison, plankton make easy prey for much of the aquatic life in lakes and ponds. That’s good for many of the fish species we know best. The top aquatic predators in lakes and ponds are fish we like to catch when we go fishing. Many species of fish get very large, but all fish depend in some way on the many tiny species at the bottom of the aquatic food chain. 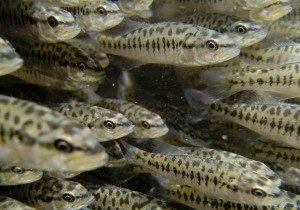 Species such as gizzard shad are grazers or filter feeders on plankton. Gizzard shad become prey for larger predator fish, such as largemouth bass and striped bass. Some fish, such as some catfish species, are scavengers and eat whatever they can find. Like plants on land, aquatic plants spread out in beds or clumps and attract a variety of animal life. Some plants live entirely underwater (called submergent), while others have some of their parts sticking out of the water (called emergent). To survive, all plants need water, carbon dioxide, sunlight, and nutrients such as phosphorous and nitrogen. Water plants have special adaptations that help them thrive in their underwater environment. Waxy or slimy coatings protect them from drying out when water levels drop. Porous stems or leaves let them absorb minerals right from the water. Some have leaves that float on the surface, while others float entirely on the surface..
Sunlight can only penetrate so deeply into the water of a lake. Where sunlight reaches the bottom rooted plants can grow. This is called the littoral zone, and is often the area of the lake from the shoreline outward to the point sunlight no longer reaches bottom. This is like a narrow band or strip reaching out into the water from the shoreline and islands. These bands of plants hold the greatest variety of life (biodiversity) to be found in the lake ecosystem. They provide important habitat for many species of fish. While aquatic plants can become a nuisance if they overgrow their habitat, they play an important role in aquatic ecosystems and help maintain or improve water quality. Nearest the shore, this area may look more like a wetland than a lake. It is a transition area between dry uplands and permanently deep areas of a lake or pond. Mud along the shoreline often contains tracks of all kinds of animals. Look carefully— maybe a deer or raccoon has been there. The littoral zone’s plant beds serve to shelter prey organisms from predators and are a food source for aquatic insects. In North America around 8,000 species of insects spend some or all of their lives in the water. Some of these insects feed directly on plants, while others feed on life found on the plants. As water runs downhill through the pond’s watershed, it picks up small bits of soil and anything else that can be moved. This erosion deposits sediment to the pond, filling it with soil and other materials making the pond shallower. The surface water that fills the pond can also carry pollution into the pond. Soil and plant nutrients such as fertilizer washed down from homes and fields can be pollutants. Too much fertilizer unbalances the way in which nutrients naturally cycle through the pond’s ecosystem. A common result is too much plant and algae growth. This process of excessive nutrient input and subsequent plant and algae growth is called eutrophication. When excessive amounts of plants or algae die all at once, it can create an unnaturally high level of anaerobic decomposition that can use up all the dissolved oxygen in the water. This can even be so extreme that some fish in the pond may die from lack of oxygen. Every body of water is only as clean and healthy as the water that drains into it off the land in the watershed. Because of this, good watershed management is important to keep a pond or lake healthy. Stopping excess erosion and runoff loaded with fertilizers, pesticides, or other pollutants is the most effective way to maintain a healthy pond or lake. Keeping a buffer of plant growth around the pond can also filter out pollutants and sediment before they reach the pond. A plant buffer can improve the health of a pond or lake, and extend its life. In Texas, most ponds are built by people who want the benefits healthy ponds provide so they often take actions to maintain ponds, including removing sediments. Texans use lakes for drinking water, industry and agriculture, but lakes are also where we go for recreation. Texas lakes provide water for fishing, boating, swimming, skiing, windsurfing, paddling, sailing, kiteboarding, and many other fun activities. (Fig 9.5) When people visit a lake they often buy gasoline, groceries, bait and many other items from local businesses. 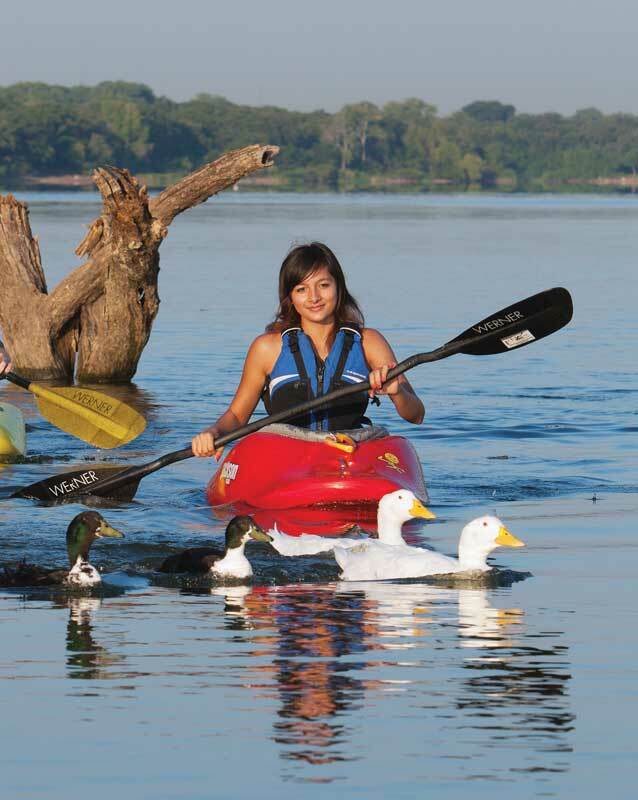 Lake-related recreation is important to the economies where lakes are located. This is among reasons why Texas fisheries managers work to create good fishing. Lakes and ponds contain lots of fish species popular with anglers. These species include bluegill, largemouth bass, catfish, crappie, striped bass, and white bass. While many fish in Texas’ lakes and ponds are native to the state, some species have been introduced from elsewhere. 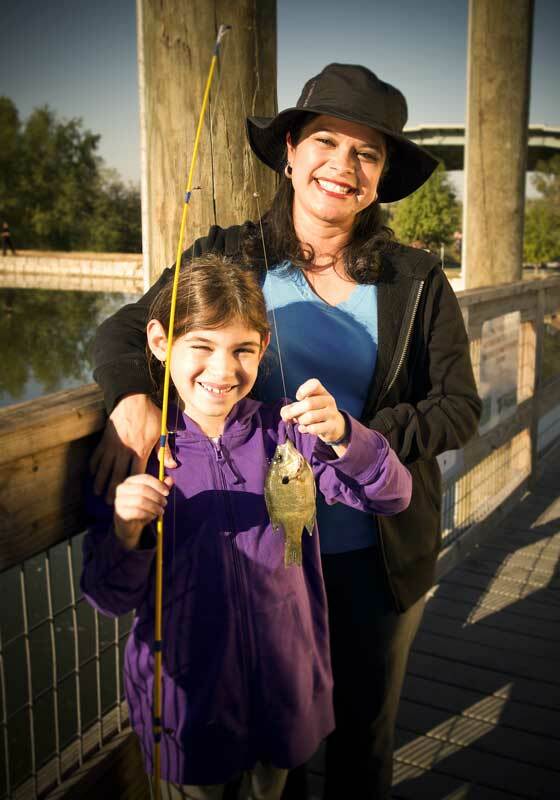 Many fish are stocked each year in Texas lakes to provide better fishing opportunities. (Fig. 9.6) Many of Texas’ large lakes are famous for fishing. For example, Lake Fork in East Texas is one of the country’s best lakes in which to catch huge largemouth bass. 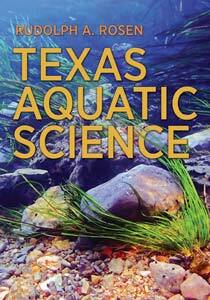 Texas Aquatic Science Lakes and Ponds was written and edited by author Rudolph Rosen. Project support came from the Ewing Halsell Foundation and the Sport Fish Restoration Program.